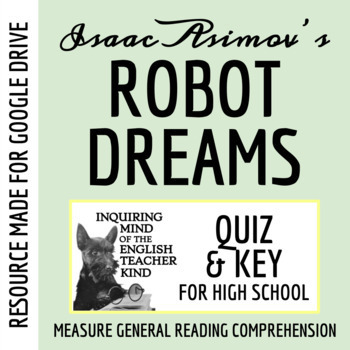 This editable 15-question resource measures comprehension and holds students accountable for the assigned reading of "Robot Dreams" by Isaac Asimov. An answer key is included, as are Word Document, Google Document, and PDF files of the assessment. All questions are aligned to the Common Core standards for reading literature, language, and writing at the ninth and tenth grade levels. This resource is available in a discounted bundle.